To ensure optimum governance of the state (regions, sectors, specific activities) all management system units (tasks, functions and services, normative environment, institutional framework, budget funding) have to operate in strong cooperation and consistency, which should be defined by corresponding documents. Unfortunately this logical relevance does not always exist. Documents and information are weakly connected, because of the huge complexity of units that objectively hinders implementation of the strong linkage and seriously weakens management quality. The situation can be radically improved by usage of ontological methodology for development of the back-office of the management system—strict structuring of objects and their decomposition in elementary logical units to form different hierarchies of information. Each hierarchy displays some aspect of information. Connection of related units of the information from different documents (hierarchies) creates a full graph of relevant information; it enables processing and usage of management information in static and dynamic regimes—definition and concretization of normative acts, institutional structure, funding—passage and execution of tasks, etc. Analysis of information from different aspects, checking its consistency, and making appropriate decisions on this base is becoming possible, thus minimizing threats to well-functioning and development of the country. Two case studies illustrate the current usage of the proposed principles. Complexity of the informative model requires appropriate level of IT support. Requirements as well as short descriptions of developed IT tools are included; they are oriented on usage by non-IT specialists (civil servants). Projections of further activities for improvement features of the model and consummation of IT tools are mentioned. Barzdins, J., Zarins, A., Cerans, K., Kalnins, A., Rencis, E., Lace, L., Liepins, R., Sprogis, A. (2007). GrTP: Transformation based graphical tool building platform. In A. Pleuss, J. V. den Bergh, H. Hussmann, S. Sauer, D. Gorlich (Eds. ), Model driven development of advanced user interfaces 2007. Retrieved from: http://sunsite.informatik.rwth-aachen.de/Publications/CEUR-WS/Vol-297/. Barzdins J., Cerans K., Grasmanis M., Kalnins A., Kozlovics S., Lace L., Liepins R., Rencis E., Sprogis A., & Zarins A. (2009). Domain Specific Languages for Business Process Management: A Case Study. Retrieved from: http://www.dsmforum.org/events/DSM09/. Booch, G., Jacobson, I., & Rumbaugh, J. (2000). OMG unified modelling language specification. Retrieved from: http://www.omg.org/docs/formal/00-03-01.pdf. FM. (2013). EU funds activities and projects. Retrieved from: http://www.esfondi.lv/events.php?id=496. GFOA. (2011). Zero-base budgeting: modern experiences and current perspectives. The Government Finance Officers Association. Retrieved from: http://www.gfoa.org/downloads/GFOAZeroBasedBudgeting.pdf. Jennings, P. (2008). Issues in strategic decision modelling. http://arxiv.org/ftp/arxiv/papers/0804/0804.0937.pdf. Latvia.lv. (2013). The guidebook in e-Latvia. Retrieved from: http://www.latvija.lv. OPB. (2013). Budget tool; Governor’s office of planning and budget, the state of Georgia. Retrieved from: http://budgettool.opb.state.ga.us. Recovery. (2013). Accountability and transparency board. Recovery act spending. Retrieved from: http://www.recovery.gov. State Chancellery. (2013). POLSIS—Politics planning documents database. Retrieved from: http://polsis.mk.gov.lv. Trnka, D. (2008). 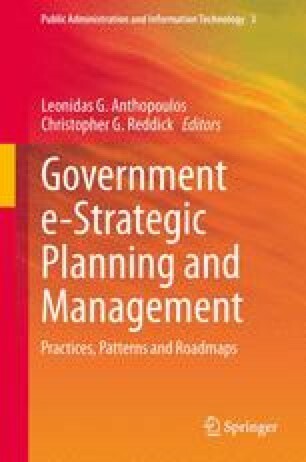 Public Administration Process Modelling and Reengineering in the Czech Republic. Ministerstvo Vnitra Česke Republiky. Retrieved from: http://www.mvcr.cz/soubor/cz-trnka-public-admin-process-modelling-pps.aspx. VSAA. (2013). The state social insurance agency. Retrieved from: http://www.vsaa.lv/en/about-ssia/objectives.